EDWARD TENNER is a distinguished scholar of the Smithsonian's Lemelson Center for the Study of Invention and Innovation and a visiting scholar in the Rutgers University Department of History. He was a visiting lecturer at the Humanities Council at Princeton and has held visiting research positions at the Institute for Advanced Study and the University of Pennsylvania. His essays and reviews have appeared in The New York Times, The Washington Post, The Wall Street Journal, The Atlantic, The Wilson Quarterly, and Forbes.com, and he has given talks for many organizations, including Microsoft, AT&T, the National Institute on White Collar Crime, the Smithsonian Associates, and TED. His book, Why Things Bite Back: Technology and the Revenge of Unintended Consequences, written in part with a Guggenheim Fellowship, has been translated into German, Japanese, Chinese, Italian, Portuguese, and Czech. We are living in a second age of efficiency. Why are citizens around the world so unhappy with their governments, so ready to look to extreme solutions? This book is a critique of something self-evidently desirable, even wonderful, until it isn’t: efficiency. And it’s also about an apparent oxymoron that seems absurd until we realize that it’s also been essential: inspired inefficiency. Efficiency is mostly good but, like all good things, can be carried too far; even an excess of water can be lethal……. Since 2008, the dream of utopia through ever-increasing electronic efficiency has been dimmed. Edward Tenner explains how the controversies of this “second age of [electronic] efficiency” hearken back to the controversies of the “first age” of mechanical efficiency, from the 1870’s to the 1930's. As industrial economist Henry George wrote in 1879: “The present century has been marked by a prodigious increase in wealth-producing power. The utilization of steam and electricity, the introduction of improved processes and labor-saving machinery, the greater subdivision and grander scale of production, the wonderful facilitation of exchanges, have multiplied enormously the effectiveness of labor. The economic insecurity wrought by mechanical efficiency caused society to be rent by decades of economic depressions where unemployed mobs were incited to riot and revolution. Communism, fascism, world war, and genocide were spawned by people made desperate by “efficiency” resulting in mass unemployment. A new Liberal Globalist world, led by the United States, emerged from the war, and restored prosperity and a semblance of order for 50 years. Large question: Did Britons and Americans revolt against their Establishment elites because they lost their jobs due to computer automation and were angry at being unemployed? Small question: did Britons and Americans revolt against their Establishment elites because they were snookered by “fake news” on the Internet? Tenner gives his view of the “small question.” He feels (as I do) that there was a proliferation of “fake” news in the 2016 elections, but that it was unlikely to have affected the outcomes. However, that brings up a larger point. The “fake news” proliferated because the Internet has placed people in direct contact with points of view on many websites that have not been vetted by the Establishment Media. According to many Liberals, the public is being “brainwashed” by rightwing lunatics who make things up and distort reality. According to Conservatives, it is the "Left Wing Mainstream Media" that brainwashes people with bad information, and it is the democracy of the internet that sets things right. I couldn't discern Tenner's political take, but he generalizes the issue by asking the more important question (paraphrasing), “How can we educate people properly when the Internet has removed the vetting process that traditional publishing houses used to apply to information that was published in newspapers and textbooks?” People are accustomed to believing everything they see in print. How can we train them NOT to believe everything they see on their computer when it down loads an un-vetted internet page? Tenner talks about other aspects of computer technology, such as navigating by GPS, being educated by computer courses, the travails of print journalism in the age of electronic media, and the efficacy of diagnosing medical disorders by computer. These are interesting topics, but do not address the “large” economic question of whether computer automation and the internet are disrupting society to the point of causing the economic earthquake of 2008 and the political earthquake of 2016. This book contains a lot of well researched salient examples, but never really builds to anything other than its initial observation - that our blind pursuit of efficiency in a localized context is paradoxically inefficient. It was an interesting read, but very dense, overly verbose, and shallow in recommending a path forward for the presented problem. out the wrinkles of life, this is the book for you! Great fun. Covered the topic very well and l had in mind the universiy l was teaching part-time. Some of the chapters were a little off topic I thought. Still a good read. This was one of the worst books I have read in recent memory. 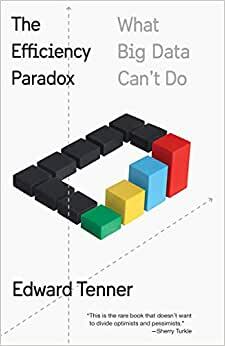 Neo-Luddite Edward Tenner fails to make one convincing argument throughout the entire book that the efficiency of technology is, in actuality, a detriment in some scenarios. It was an interesting hook that drew me in, but the book simply fails to deliver on its promise. GPS systems can inadvertently lead people to their doom? Smartphones are great, but they distract kids in school? Yawn. A lot of older folks have been preaching these things for years. It was stupid then, and it's stupid now.